Rhinoplasty has been gaining more and more popularity among African Americans since over the last three decades. Majority of individuals undergoing this cosmetic surgery are either interested in improving breathing conditions by rectifying deviated septum or making significant aesthetic changes by getting harmonious noses. For the African American population, it is also important to maintain distinct ethnic characteristics while embracing rhinoplasty evolution. Though no two noses are the same, considering common nasal features can make the procedure effective while preserving the cultural identity of patients. So, let us discuss everything about African American rhinoplasty in this post. Keep reading. 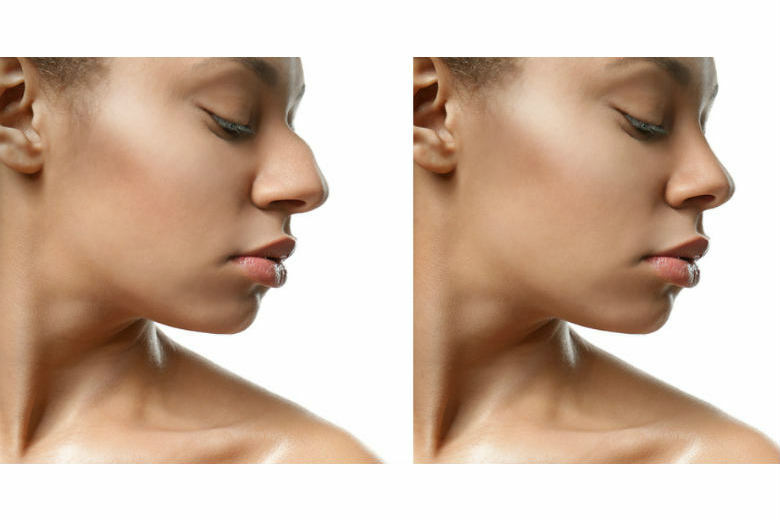 What Is African American Rhinoplasty? Flared ala or overly wide nostrils is the most common concern that used to be addressed through skin excision earlier. However, these days nostril reshaping is giving more natural curves sans scars. A broad, flat, and depressed (low/concave) dorsum or nasal bridge is linked to dorsal irregularities. Typically, cartilage graft from ear or septum is used for bridge augmentation or bone narrowing. Sometimes the nasal tip looks bulbous or less defined with decreased projection. This is rectified by narrowing the bone or reshaping the cartilage present in the lower part of the nose. Hence, it is essential for the surgeon to consider the ethnic background and understand the nuances of the nasal anatomy of the patient before planning the surgical procedure. 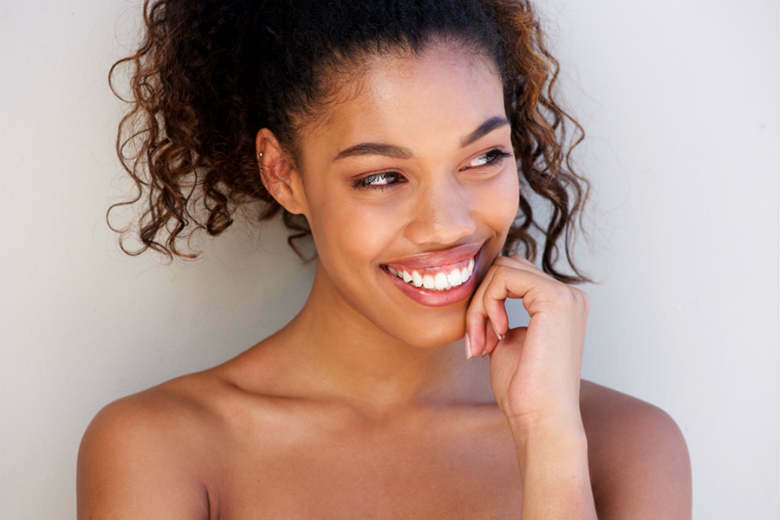 African American rhinoplasty is a specialized version of rhinoplasty surgery, which focuses on the ethnic features of noses for enhancing the natural beauty of African American individuals. Like traditional rhinoplasty, it does not put emphasis on altering the natural traits of the patient by pinching and turning it up. Instead, the goal of this procedure is to strike a balance between the nose and other facial characteristics in order to ensure a perfectly natural look. Typically, it is done by tapering the nose bridge, narrowing the nostrils, or refining the tip of the nose along with the use of implants or harvested cartilages. Though this ethnic rhinoplasty is highly complicated in nature, its outcome is a well-defined, well-supported, and well-harmonious appearance. An ideal candidate for this cosmetic surgery must be aged 15 years or older as before this age the nose does not develop fully. She should desire some form of nasal refinement for addressing specific concerns while maintaining her ethnicity as well as the harmony with the rest of the face. Though there are similarities in the equipment used and the surgical methods followed, African American rhinoplasty is still very much different from standard rhinoplasty both technically and strategically. Hence, a personalized approach to the surgery is followed based on the unique nasal features and desires of the patient. When the lateral flaring of the alar base is greater than 2 mm., an alar base resection is performed by keeping the external nasal valve aperture preserved. On the other hand, nostril sill resection and advancement are used to improve the interalar distance. Tip bulbosity is rectified by removing the excess fibro-fatty tissue from the tip of the nose through careful cartilage excision (cephalic trim). This debulking is then followed by augmentation maneuvers for additional accentuation of the nasal tip. Generally, autologous cartilage tip grafts (tip onlay grafts or infratip lobular grafts) are placed through the open approach and tip sutures (transdomal or interdomal or intercrural) are used through the endonasal approach. This helps in strategic placement of the grafts onto existing cartilage or into subcutaneous pockets for an enhanced and well-supported tip. Structural cartilage grafting helps in supporting as well as lifting the nasal tip. Typically, the septal extension graft or the columellar strut graft is used for adequate projection. However, the columellar strut graft, which is fixed to the nasal spine or left floating freely is preferred by surgeons for increasing and maintaining tip elevation. The nasal dorsum is augmented by creating an infracture proportional to the nasal lobule. This, along with interalar width reduction and tip refinement, gives an illusion of slimming down the nasal bridge. Usually, autologous tissue (units of cartilage and bone) or alloplastic materials (silicone, AlloDerm, Gore-Tex, etc.) are used for this purpose. 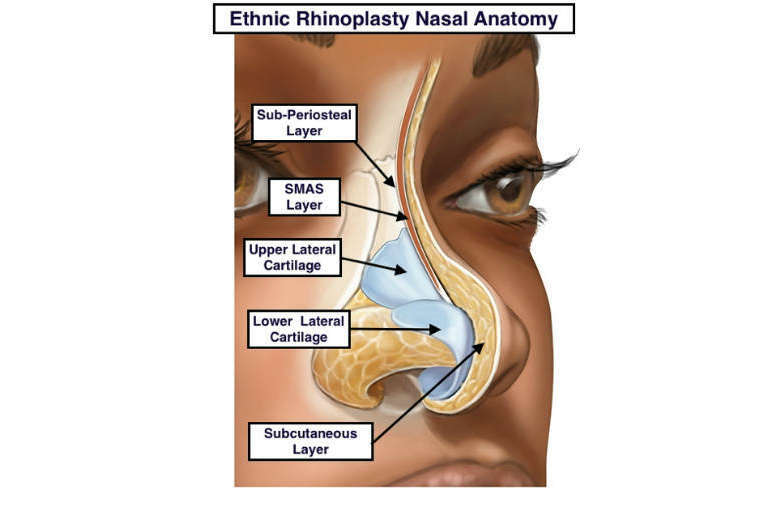 African American rhinoplasty can be done in either a hospital or an outpatient facility. Both general anesthesia (twilight sedation) and local anesthesia (intravenous sedation) are suitable for this. The surgery usually takes 2-3 hours to be finished with no additional procedure performed. In African American rhinoplasty, scars are not much visible as they are concealed either within the nose or underneath the nasal tip. You will be experiencing swelling and bruising, which will take longer to subside due to the thickness of the skin. Keep your head elevated for a day or two after surgery in order to reduce excessive swelling and discomfort. A little bleeding is normal for the first few days. Post-operative pain and/or nausea is also common and your surgeon may recommend painkillers for alleviating it. There will be a nasal cast to help reduce swelling and bleeding for which you may find it difficult to breathe through your nose for first 2-3 days. However, it will be replaced by tape after a week and you will have to continue it for 6-8 weeks. Make sure that you avoid blowing your nose and all other kinds of trauma during the first week after the surgery. The complete recovery for this specialized rhinoplasty may take 10-14 days. But the side effects start subsidizing from a couple of days after the surgery and you can return to your work within as little as 7 days. Like all other cosmetic surgeries, African American rhinoplasty also comes with its own risk profile. Some of the most common risks associated with African American rhinoplasty include scarring, keloid formation, prolonged edema, alar base asymmetry, tip necrosis, racial incongruity, etc. Others postoperative complications encountered by patients are excessive bleeding, infection, breathing trouble, anesthetic issues, implant-related problems, pigment abnormalities, revision surgery, and septal perforation. The overall cost (including facility fee, anesthesia fee, and surgical fee) for African American rhinoplasty ranges from $3,000 to $8,000 on average. Find a board-certified cosmetic surgeon, who specializes in ethnic rhinoplasty and has extensive experience in performing African American rhinoplasty. Discuss your goals with your surgeon clearly and keep your expectations realistic to help him/her determine the best operative plan for you. Quit the habit of smoking at least one month prior to undergoing the rhinoplasty. Consult your surgeon and stop taking certain medications including aspirin, anti-inflammatory drugs, herbal supplements, etc. Pretreat your skin (bleaching, using Retin-A, microdermabrasion, etc.) anytime between 2 and 6 weeks before the procedure in order to improve the quality of the skin and reduce the risk of scarring.